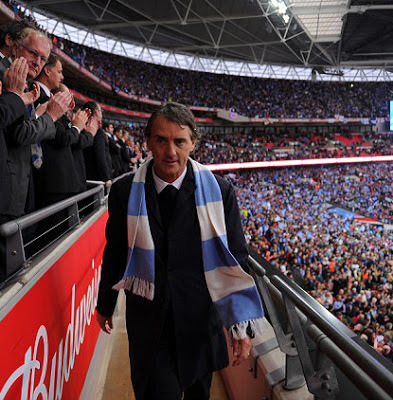 Roberto Mancini has been 'relieved of duties' by City's owners, exactly one year to the day they won the Premier League. I hope the most successful City manager since Joe Mercer will always be remembered for his achievements at City and not for his failings, as the media love to point out. Mancini succeeded where countless other managers down the years failed dismally. I will never forget the joy of seeing City win the FA Cup and especially the Premier League title, which I thought I would never see in my lifetime! The 6 - 1 victory over United wasn't bad either! I'm sure most Blues will wish Roberto all the best in his future managerial career, I'm just hoping one of his future teams doesn't come back to haunt us!